Amy Sueyoshi, associate dean of the College of Ethnic Studies, is the curator for a new exhibit at the GLBT History Museum. Sueyoshi believes "people don't frequently understand the power of history," and that this event will make it easier for younger folks to come out. Photo by Virginia Tieman. The queer Asian Pacific Islander community will get the chance to impart their stories of gay rights activism to the public at the GLBT History Museum this fall. The exhibit, “For Love and Community: Queer Asian Pacific Islanders Take Action” stems its material from first hand sources. Pioneers and witnesses of the of the queer Asian and transgender communities submitted snapshots and audio clips of their experiences. The exhibition includes a combination of curator Amy Sueyoshi‘s professional and personal experiences. 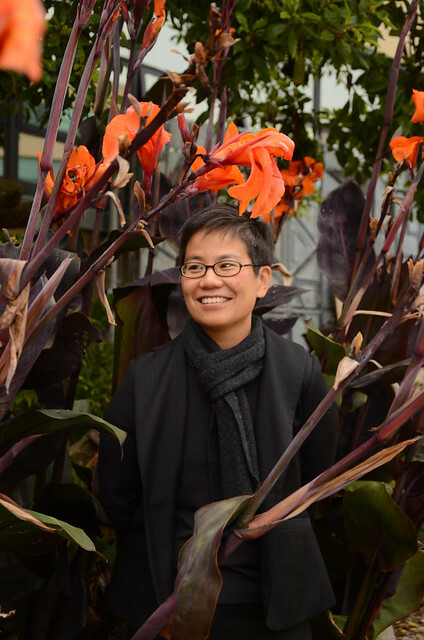 Sueyoshi, SF State associate dean at the College of Ethnic Studies, has forged friendships with original activists for queer Asians and transgender communities. “The purpose of this exhibition is to serve as a beginning rather than to mark an end,” Sueyoshi said. “I hope it will encourage conversations and spur movement to preserve stories that are constantly at risk of being lost. We must hold close and make public our own histories, since no one will do it for us,” Sueyoshi said. The SF State Cesar E. Chavez institute rewarded Sueyoshi with the Community University Empowerment Grant, which is given to support socially engaged projects that are closely tied with communities of color. The exhibit captures the fusion between Asian and queer activists starting in the 1960s that took place in San Francisco’s Chinatown. Located in the Castro District, the GLBT History Museum is the first museum in the United States and second in the world that highlights the history of the LGBT community, according to its website. “For love and Community: Queer Asian Pacific Islanders Take Action” opens on Sept. 18, with a reception from 7 p.m. to 9 p.m. Admission is $5 for adults and $3 for students with a student ID.